Why should a business use digital signage? Digital screens allow any business to easily showcase their products, services or any other content for that matter, helping them to stand out and engage with more customers. A digital screen provides the most flexible banner in the world. Available in all shapes and sizes, from single large format screens to multi-screen video walls, free standing kiosks, shelf edge displays and tablet devices, choose one or pick any combination to suit your needs. A wider range of products and services can be shown e.g. a restaurant could utilise a series of digital menu boards that display a different menu as the day progresses – i.e. breakfast, lunch and dinner. With simple cloud-based Content Management System (CMS), a single or an entire network of screens can be managed remotely. It is impressive and will engage more customers at the point of sale, or make an atmosphere more lively or unique, with a powerful influence on buying decisions. To boost awareness and sales, it can be used as a tool to interact with customers as an entertainment medium e.g. waiting areas in an airport or train station to communicate messages to your customers. It can also be used as a medium for your employees e.g. internal communications, meeting rooms. It is quick and easy to update at any time (even immediately) and schedule content – you are completely in control. It can be used as a platform to showcase work e.g. a building company could set up a slide show to allow prospective clients to view some of their completed projects. People tend to trust peer recommendation over advertising, displaying projects you have worked on for others will help promote your brand, and reinforce trust in your services. No costly printing, delivery or installation, unlike traditional point of sale. It allows the option of generating additional money from third party advertisers e.g. in large shopping centres, ATM toppers, health centres. Twitter feeds, currency updates, weather updates and more can be incorporated into the display as well as blog posts e.g. a doctor or dentist waiting room could display general health facts and tips and feature real-time news via an RSS feed. You can display anything you choose to from news channels to twitter feeds, photographs to advertisements – the list is endless. A few years ago digital signage was really expensive and complicated. The situation is very different today. If you aren’t using digital signage, you’re lagging behind and letting potential customers walk past you. If you haven’t signed up yet, now is the time to apply digital signage to your business. Even in the smallest form your setup can always be developed and will provide you with a starting point for growth and development. 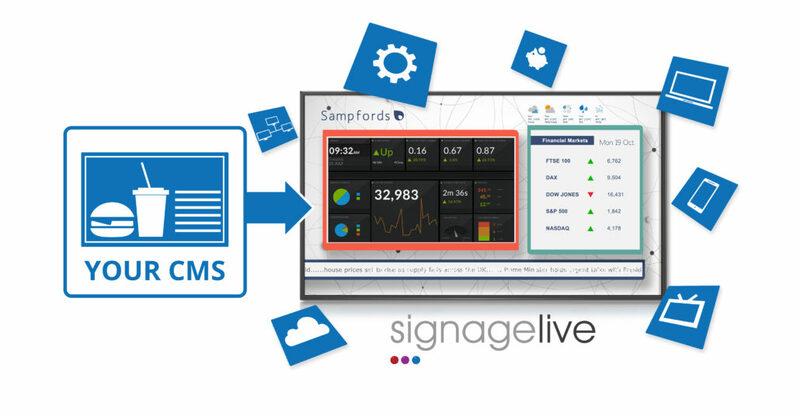 In addition to the costs to purchase and setup a digital signage solution, many customers in the past found themselves paying expensive annual support contracts, without which, they would not receive the latest software updates, support and even worse find their digital signage software will no longer work.